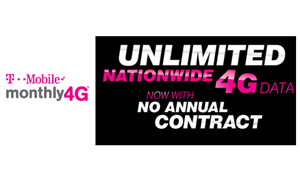 T-Mobile USA has begun offering its Unlimited Nationwide 4G Data plan with no annual contract. The service is priced at $70 per month. The company notes that since launching its Unlimited Nationwide 4G Data plan in September, it has become by far the most popular plan choice among T-Mobile customers, with nearly half (46 percent) of new customers opting for the new data plan in December 2012.